It can also be used interactively with the Pi. The Pi’s GPIO ports are also broken out on the board as well. There’s a 72 point prototyping area, with GND, 3V3 and 5V rails, where you can add your own components. As with other RasPiO® boards, all the ports are clearly labelled and there are lots of options. 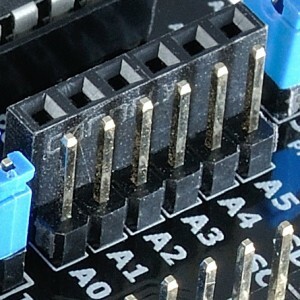 Each of the useful pins on the ATMega are broken out to a cluster of three holes. Male and female headers are provided, so you can connect whatever you like to your RasPiO® Duino. RasPiO® Duino is an easy, low-cost introduction to Arduino programming on the Raspberry Pi. 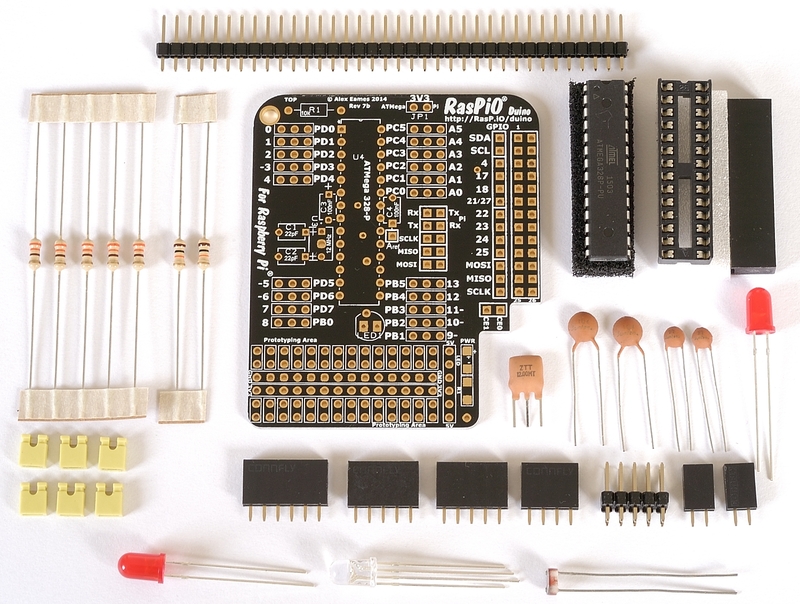 The RasPiO® Duino kit costs £12 + shipping and contains everything you need to start Arduino programming (as long as you already have the Pi). Right here, right now using any credit/debit card or Paypal account. RasPiO® Duino is also available from The Pi Hut, Pimoroni and Pi-Supply. For programming, we add three jumpers to connect the micro-controller’s SCLK, MISO & MOSI directly to the Pi’s corresponding pins. 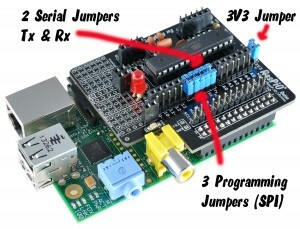 For two-way serial communication with the Pi, if you need it, you can add two more jumpers to connect the Pi and ATMega’s Rx and Tx serial ports. RasPiO® Duino uses the ATMega 328P-PU which is the same micro-controller chip as both Arduino Uno and Gertboard. It has a 6 channel analog to digital converter (ADC) and 14 digital I/O pins, 6 of which can also be used for PWM. RasPiO® Duino is great for beginners, but it’s not just for beginners. There’s a host of optional features that can be used by more advanced users. The RasPiO® Duino runs on 3v3 at 12 MHz (not 5V at 16 MHz like the Uno). If you want to choose a different analog voltage reference, Aref (<3v3), you can cut one track on the back of the board, add a capacitor and a header pin and connect your voltage reference. This can offer greater measurement precision with things like temperature sensors. The PCB has some surface mount pads on the back if you prefer to use surface mount capacitor(s) and resistor(s) to free up space on top (not provided). There is also a pad to add an optional ‘power on’ LED on the front (not provided). What RasPiO® Duino Doesn’t Do! designed to take standard arduino shields. an Arduino clone. It has different shape, size and pin arrangement and runs at 12 MHz on 3v3.